Well, it’s September. That means that ARC August has come and gone. It was hosted by the ever lovely Octavia at Read.Sleep.Repeat. Now, I was hoping to blow my goal out of the water but that was very far from what really happened. The two football books were digital copies and I was saddened to find out that they expire. This means that, pretty early into the month, I lost access to them so 2/3 failed almost immediately. While I absolutely loved what I read of We Are Not Ourselves life just didn’t want me to finish reading. I fully intend to finish it, August just wasn’t the right time. I did, however, read a new eARC I got from NetGalley called Just a Little Crush by Renita Pizzitola. I’m glad I got to add it to my ARC August because it was a lovely, light and cute read…just what I needed at that point. 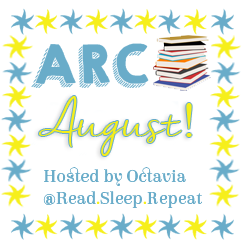 So that was my ARC August, not completely successful but also not a complete bust! I also loved being a part of my first Twitter chat thanks to Octavia.